Note: When undertaking any physical activity, know your own limitations. Please make sure you are prepared for the weather with plenty of water, sunscreen, and proper clothing to stay safe. The Dripping Springs Trail is located in the OMDP off of, you guessed it, Dripping Springs Road. It is about a ten-mile drive from New Mexico State off University Ave (15000 Dripping Springs Rd, Las Cruces, NM 88005 for your GPS needs). You’ll know you’re on the right path when you notice the monument sign and the yellow gates signaling the protected area. It is open between 7am and Sunset. The first thing you’ll do once arriving is park in the primary or overflow lot (which can accommodate RVs) and head into the Visitors Center to check in. Make sure to bring $5 in cash per carload to secure your daily permit and then your hike can officially begin! The trail begins right behind the bathroom building and is wide enough for two-to-three people to walk side-by-side comfortably. It is a well-maintained, small- to medium-sized gravel path with infrequent periods of larger (slipperier!) rocks and some dirt patches. For this hike, I brought along some Mizuno Wave running shoes with decent tread left, about 20 oz. of water, a bag of local jerky, and lots of sunscreen and chapstick! It is a steady incline for the majority of the “out” portion of the trail but there are well-placed shade trees and even some benches along the way to take a breather or enjoy the amazing views. 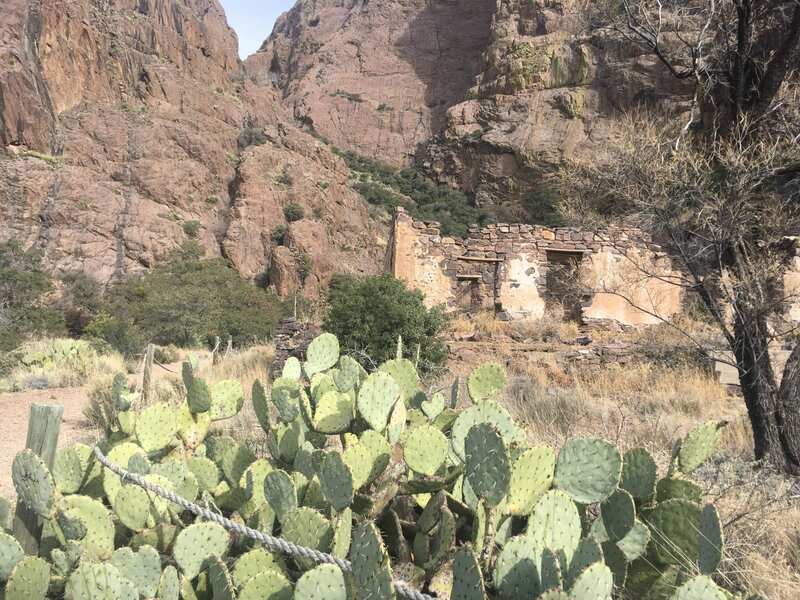 About half a mile into the trail, you will see a turnoff for Crawford Trail, but continue on along the Dripping Springs path. 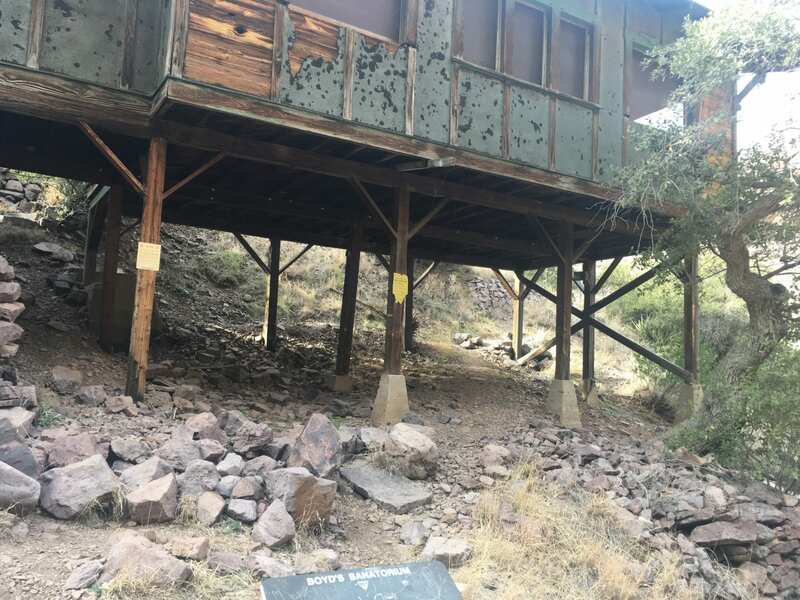 After traversing upwards for a little over a mile, you will hit the clearing that houses the remains of the Van Patten Mountain Camp/Dripping Springs Resort Livery. Built in the late 1800’s, these buildings acted as the hub for the servicing of the hotel a little further up. 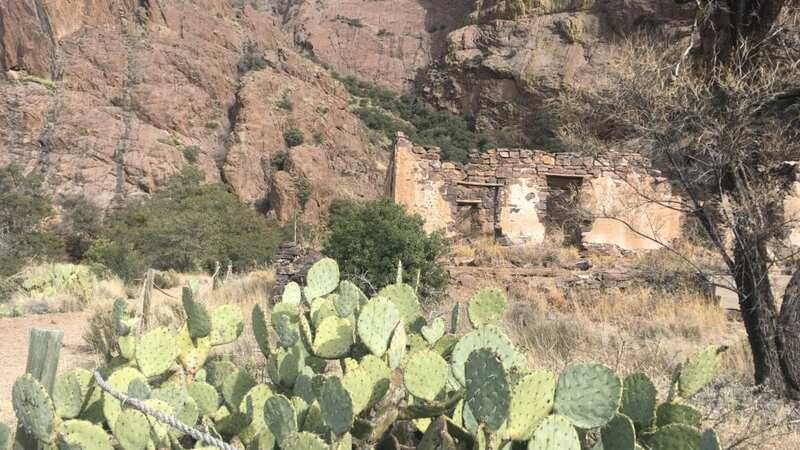 This is where the wagons unloaded supplies, horses were watered, the chicken coop was kept, and even a vegetable garden grew food for the guests. The stagecoach delivering guests would drop them at the resort’s front door and then head back down to this location. This is also a great place to take a selfie with the valley behind you. Leaving the Livery, follow the trail up to a crossroads. Take a left and head towards Dripping Springs and Van Patten Mountain Camp; we’ll get back to Boyd Sanatorium. Depending on the time of year that you are visiting and any recent rainfall, the Springs might be a trickle or more of a waterfall. Don’t be unimpressed because this modern marvel was built in 1892 to harness water for the hotel’s supply. The reservoir no longer has its pond, but it is easy to understand what an important part this area played in the self-sufficiency of the Dripping Springs Resort. Heading up about a tenth of a mile or two more, you hit the remnants of the Mountain Camp/Dripping Springs Resort. 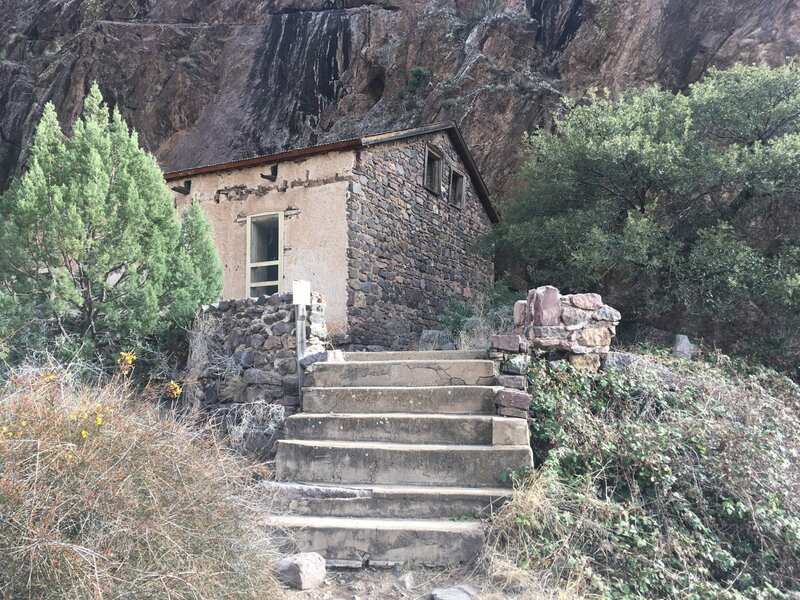 From the late 1800’s until around 1915, Major Eugene Van Patten ran a hotel in this spot–at 6,000 ft elevation and 17-mile trip from Las Cruces with the only mode of transportation being on the back of a horse or burro. The original resort had a total of 14 rooms and in 1906, another 18 rooms were ordered. Spoiler alert, Van Patten ran into some financial difficulties and had to sell the property in 1915. But to find out to who, you’ll have to hike up and read the plaque yourself! Head back the way you came and you’ll hit the turnoff to Boyd Sanatorium you passed previously. This will be the steepest tenth of the mile of the whole journey, but it’ll be worth it! You’ve reached the highest elevation of the hike. Around 1910, Dr. Nathan Boyd, a medical doctor, built this structure to act as housing for tuberculosis patients. It is as eerie as you’d imagined, shaded from the sun by the encompassing mountain. I came on a cloudy afternoon which added a whole new level of quietness and dispersed light. After snapping a few photos and learning about the history of the building’s use, I scampered carefully back down, trying not the slide down the incline. Be careful here! The Dripping Springs Trail is definitely easier on the way back! Settle in for some steady downhill for next mile and a half back to the parking lot. The way down is the perfect opportunity to snap pictures of the Mesilla Valley opened up before you. There are also some interesting mountain outcroppings from the La Cueva Trail visible on the way back that are worth a selfie. This is the time of the hike where you tell all the people who are heading up that it is worth it and keep it up. Take a moment and reflect on how you felt beginning the journey into the unknown–huffing and puffing–and how a word of encouragement could make all the difference. Or is that just me? Hiking not your thing but still looking for a good workout? 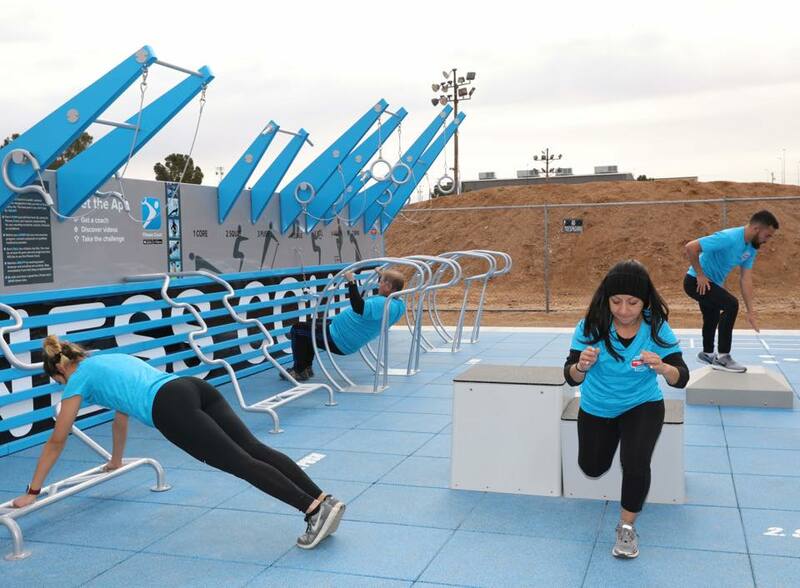 Check out the City’s new Outdoor Fitness Court at the Hadley Sports Complex instead. Download the accompanying app to watch demonstrations of the available exercises, join a challenge or challenge a friend, even take a class! A great new amenity to the Las Cruces recreation landscape. Do you have the right fashion choices for desert hiking?